I have an Asus H8M1-E/M51AD/DP_MB motherboard. I just wanna know what the best processor and video card it can hold. I can't afford a new PC and I just wanna make this one last while I go through college while being able to make the best of it. Here is the CPU support list for the Asus H8M1-E. One of the i7-47xx CPUs would be the best. But is your board the retail version or is it in a pre-built PC? The gfx card will depend on what the make and model of your PSU is. The board will support any modern gfx card you can find. If there is anything else you need to know let me know. This PC is pretty bad, but it was pre-built years ago. My board was in a pre-built Asus PC. 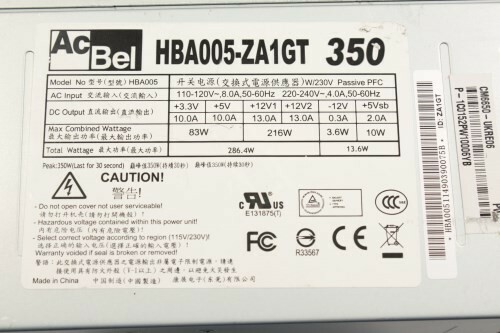 my PSU is an Ac Bell HBA008-Z1GT 350 watt. I know its bad and could use an upgrade. It appears the PSU has 216W available at the +12V rail(s). That would linit you to the GTX 1050 Ti. Not a 6-pin model unless the PSU has a 6-pin PCIe cable stashed away somewhere. Since the board is in a pre-built PC, there's a chance that the BIOS for the retail version of the board won't work. Tell me the BIOS version you have now. The BIOS version now is 0507. Could always flash... but it's risky. 0507 doesn't jive with any of the versions available for the retail board. That makes me think that the OEM version of that board requires an OEM BIOS. You'd have to go to the PC's web site and locate the available BIOS for that board. What is the model number of that Asus PC? If you don't want to do a BOS update, you'll still have to locate the PC model exactly to see what CPUs were available at the time you bought it. I think the model number is M32AD. I would be willing to update the BIOS if needed, I just need to know how. If that image is from the retail board's site, it may not be adaptable to your OEM version of that board. The BIOS either would not flash (best case) or it would flash and not work for your board (worse case). Find the exact model of that Asus PC and we'll help you locate the BIOS and CPU support list. I'd be afraid to recommend using the retail BIOS for an OEM board. I was just able to update my BIOS to 0802... it appears it may the most recent for my PC. And the most unfortunate is that the i7 4th gen processors need 0808. I guess now that we know that much. Can we go any further or can we just pick out the best cpu now. Based on your knowledge, and the fact my BIOS cannot update anymore. it seems to me that THIS is the best processor I can achieve, please correct me if I am wrong. Would it be worth upgrading to that along with I think you said the GTX 1050 Ti? Should I get another power supply or will that suffice? And should I invest in better or more RAM and if so what brand? Since your i3-4150 was launched Q2'14 and the i7-4770K and i5-4670K were launched Q2'13, it would seem to be a safe bet that the i7 and i5 would be recognized by your current BIOS, yes. Keep in mind that with an OEM board like you have, you probably won't be able to take advantage of the "K" series' unlocked multiplier for OC'ing. 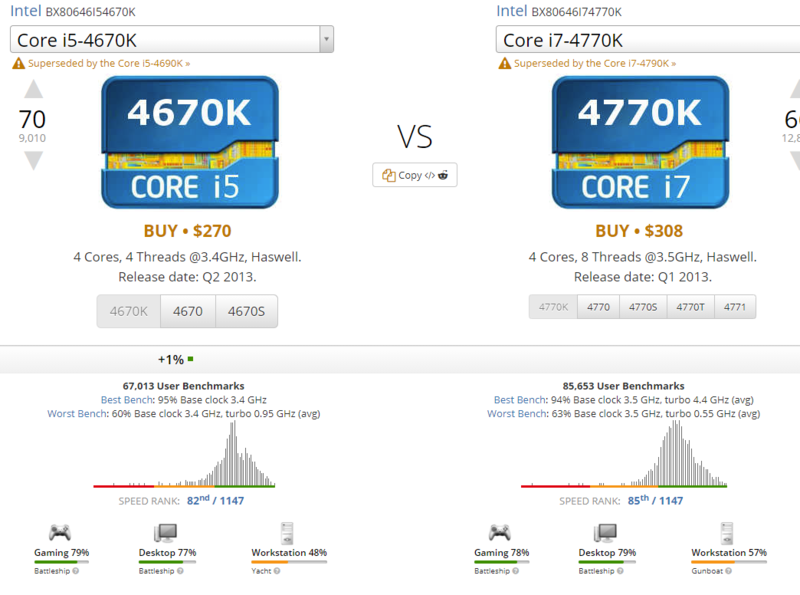 Btw, The 4C/8T i7-4770K is better at today's AAA games than the 4C/4T ti5-4670K. As to the RAM, you stated that it was DDR3 @ 798MHz. That was probably read from CPU-Z, right? If so, you actually have 1600 MHz RAM. DDR means double-data-rate; you must double the rated speed to get the true speed. Yes, you need more RAM if you do anything else at all when you game. Either try to find an exact match to the stick you have now, or better, buy a new matched set of 2x8GB DDR3 1600 Mhz RAM. Dual channel can be quite unstable unless the sticks are bought as a matched set. Thanks for all of the help, you've answered all of my questions. I do have one more question. Could you help me find a link to a GTX 1050 Ti I can buy that will fit since it can't be 6 pin? Also I am assuming my PSU is good enough? Assuming you are US-based or at least able to buy in the US market, something like this Zotac ZT-P10510A-10L Mini is probably the best deal if you are on a small budget; comes with 4GB VRAM, free game, and is short enough to not need any re-arranging of the cables to allow it to fit. If you want a short mini card that has one of the highest core clocks out-of-the-box, The Evga SC Gaming is hard to beat, but more expensive. I had this card a few years back in one of my machines. The Asus Phoenix is another mini card that falls in between those for price and also comes with a free game. Any of those should pop right in and fit w/o any alterations to your cable management, and not block any ports or other headers. They don't require a 6-pin cable for extra power, and will run on your PSU. Do you know if my PC will be able to handle an AMD RX 580? Which graphic card and processor is compatible with my motherboard?